By the 1950s, Hollywood’s Golden Age was waning, its studio system crumbling in favor of “New Wave” films and younger visionaries. The wholesome names of the 1920s and ’30s were now the distant past, though their legacies would be cemented among Hollywood’s greatest. Nevertheless, pressing on amid this sweeping change were two iconic personalities of film’s bygone era — Stan Laurel and Oliver Hardy, better known as the comedic duo Laurel and Hardy (who would make 107 films together). Baird, perhaps better known for his small-screen direction for “Vinyl” and “Feed the Beast,” removes the curtain on this iconic duo — played with zeal and affection by Steve Coogan (“The Trip to Spain”) as Laurel and an unrecognizable John C. Reilly (“The Sisters Brothers”) as Oliver “Babe” Hardy. Both Coogan and Reilly deliver award-worthy performances as the golden boys of early cinematic comedy — falling into character with relative ease. At certain points in Baird’s wonderfully captured project, his lead actors truly become their subjects, with careful mannerisms, banter and nuance. Baird’s biopic begins in 1937, at the height of Laurel and Hardy’s fame. They are preparing to shoot “Way Out West,” which would feature their famous caper outside Western-themed double doors. Each man, who has had his share of relationship difficulty, begins to recognize the impact of their impending contract squabble. Signed to Hal Roach Studios, Hardy remains under contract while Laurel aims to secure a more lucrative deal elsewhere. The film then jumps ahead to 1953 — to a somewhat bitter Laurel and an increasingly overweight Hardy. Through flashback, it is revealed that Hardy stayed put to make the 1939 film “Zenobia” with Harry Langdon while Laurel attempted to negotiate a new contract with Fox. Hardys absence doomed the deal, and Laurel was never quite able to forgive his longtime partner. Nevertheless, their paths would soon cross again. By the ’50s, they were poised to begin a music hall tour in the U.K. and Ireland — to drum up support for their proposed “Robin Hood” feature. Each man now happily married, the tour purports to strain their marriages and their physical health (Hardy more so). Now in their early 60s, Laurel and Hardy attempt to reprise their earlier bits — grueling both physically and mentally, as they are forced to do publicity stunts to lure theatergoers to their shows. While Laurel continues to pen scenes for their “Robin Hood” feature, Hardy takes a downward turn — as his health and finances begin to fail. 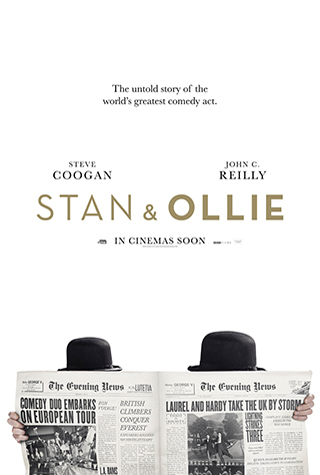 Despite these setbacks, Stan & Ollie uncovers each performer’s utter greatness, as they persevere in older age to bring laughs to fans of all ages. As their tour progresses — helmed by London-based producer Bernard Delfont (Rufus Jones, “The Foreigner”) — the seats begin to fill, a final endorsement of the duo’s contributions to cinema. Outside of the stellar performances from each lead actor, the film also features great complementary music from Rolfe Kent, along with the duo’s recognizable theme song, “Dance of the Cuckoos.” Stan & Ollie also excels visually, between its costume work (namely Reilly’s prosthetics) and Laurie Rose’s frames. The cinematographer takes the viewer on an over-the-shoulder tour of the duo’s shows, somehow managing to capture the energy and passion of the comedic greats. Altogether, despite being overlooked by The Academy, Stan & Ollie is a Top 10 film of 2018, with each act building almost palpable tension and cementing Laurel and Hardy’s legacy among Hollywood’s greatest. Baird’s film is a speedy 97 minutes, but not a single frame is wasted, thanks in part to Jeff Pope’s script, Baird’s apparent affection for the duo and the actors’ unflinching dedication. The latter is evident in two climactic scenes as the film nears its end — one at Hardy’s hotel bedside and another on the last leg of their tour. This is a truly poignant film that, while predictable at points — with the aging actors facing a “new” Hollywood — manages to engage the viewer, muster some laughs and perhaps introduce the pair to a new generation. Viewing Coogan dance alongside Reilly in front of the saloon doors, one does not have to strenuously suspend their disbelief, as the filmmakers and this marvelous cast take care of the work for them.